Tell me, what exactly is Wealth-Data? Wealth-Data is a collection of groomed end-of-day (EOD) data with historical corrections for corporate dilutions (mergers, acquisitions, stock and special dividends) for a subset of the largest U.S. equities. Wealth-Data provides traders a set of data for backtesting that can be trusted to properly reflect the value of the underlying asset and not include data spikes and cliffs that create unrealistic backtest results. Stock prices are not adjusted for regular dividends, but they are adjusted for “special” one-time dividends and other dilutive corporate actions. So how do you get rid of spikes? We define data spikes as values that represent “unrealistic fills” for backtesting. Spikes are almost always real trades, but they are outliers that usually do not represent a level at which both buyers and sellers were active. 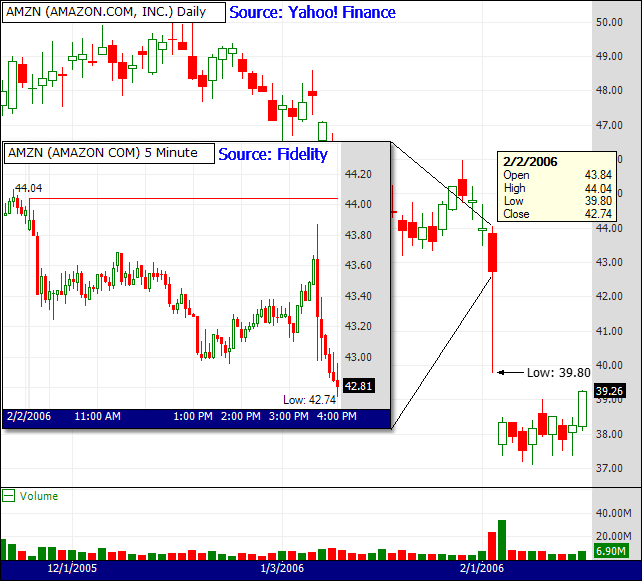 Some EOD Providers show that AMZN traded to 39.80 on 2/2/2006. 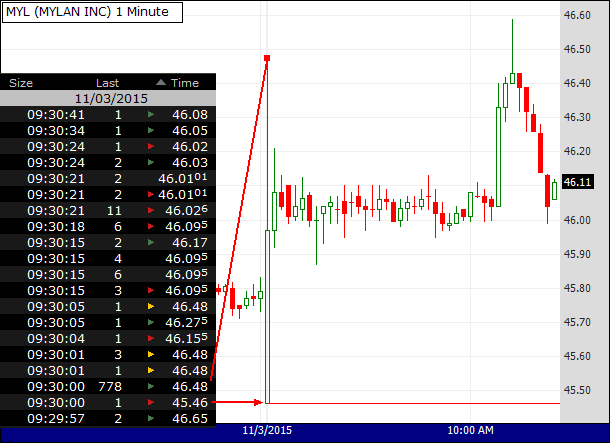 By inspecting the intraday chart we have high confidence that the actual day’s low was only 42.74. 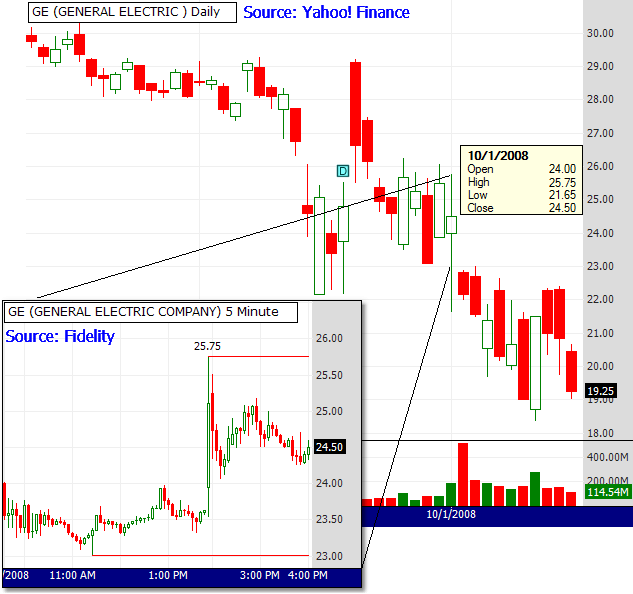 Similarly, GE’s intraday chart for 10/1/2008 indicates a low in fact 23.00, not 21.65, a 5.9% difference! After September 2009, we apply a modified statistical algorithm to filter tick data for outliers (spikes). From the filtered data, another set of intraday data are formed and compared to the EOD source as before, however, the added filtering will remove the spikes that may be present in both the EOD and other intraday data sets. Wealth-Data is kept up-to-date on an EOD basis using tick-filtered data. These are what outliers look like! This 2.8% excursion occurred in the first second of trading. …On an EOD basis, this excursion would go undetected. Wrong value for the most-used order type? Backtesting using market orders relies heavily on executing a trade at accurate opening price. 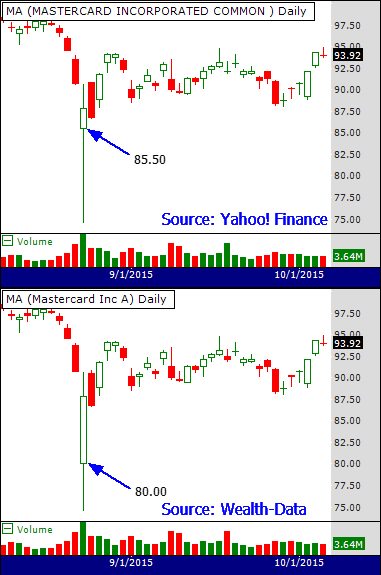 However, the market open is usually the most volatile period for price discovery of the entire session. Frankly, it’s a “crap shoot” to assume that your trade would be executed at the first traded price reported by most providers. However, many EOD traders are unaware that if an order is marked to be executed “market on open” (MOO), it will be included in the opening auction for the primary market, and this price is guaranteed. Therefore, using the open of the primary market provides higher confidence for a backtest to more closely match live trading – assuming that you use MOO orders with your broker! Wealth-Data’s opening price is always that of the primary market, not an arbitrary first-traded price by a retail trader. Time of sales shows that a single 100-share trade at 45.46 set the open (and low of the day) for MYL on 11/3/2015, but the primary market opened with 77,800 shares traded at $46.48, 2.2% higher! 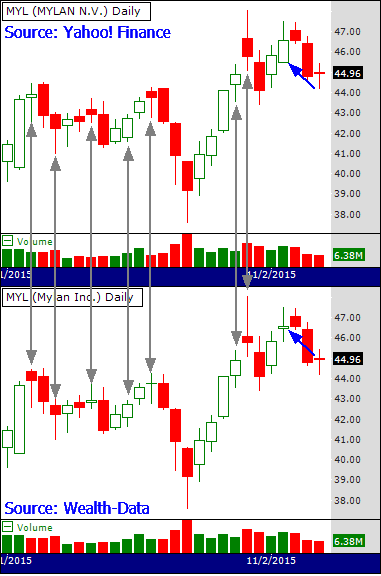 The $45.46 vs. $46.48 difference is indicated by the blue arrows on MYL’s daily chart. Several similar opening price differences between the first trade and primary market are evident by visual inspection. 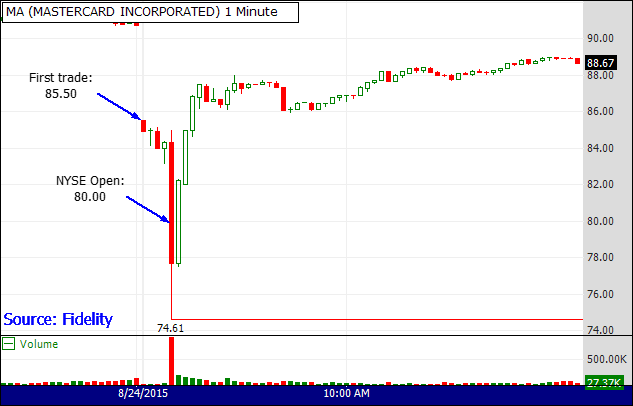 There was significant albeit low volume trading for several minutes before Mastercard’s delayed NYSE open on 8/24/2015. Differences between the first trade and the open of the primary market are usually not this bad, but sometimes they are! 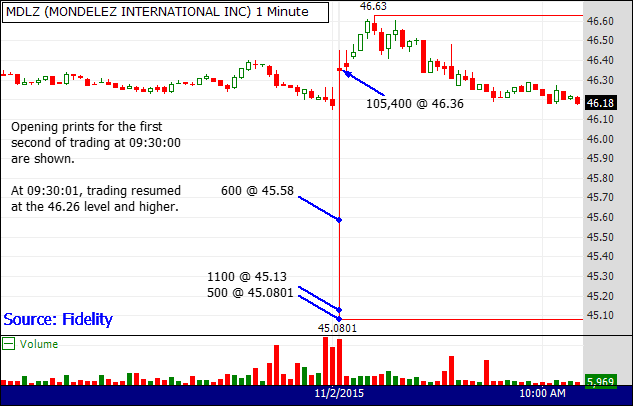 Where can you easily obtain chart data that uses only the primary market for the day’s opening price? Got a price range dispute? When you manually edit the price or volume of a bar in a Wealth-Data chart, the correction is transmitted back to the server. Our team will periodically reviews corrections and apply them to the public record should we agree with the update. What about the Closing Price? Like the session open, a similar auction process occurs near the close of the trading session at which “market on close” (MOC) orders are executed. Nearly all providers report the official exchange close based on this auction and Wealth-Data does not alter this price except when required by dilutive adjustments. Wealth-Data consists of the Nasdaq 100, S&P 100, and Dow 30 current companies. For companies that have multiple tracking stocks, one is selected so that, for example, the Nasdaq 100 has 100 stocks only. During your Wealth-Data subscription, symbol data that you’ve accessed will always be available to you, even if the company has been delisted. Symbols that are removed from an index will continue to be updated while actively traded. Delisted components of supported indices are included in Wealth-Data. This may apply to companies that once traded in an index continue to be active years later, but reverse splits cause share prices to be “astronomical” historically. To reduce this effect for backtesting an index, the company price history is split into two series: 1) one that ends at the day before the ex-date of the reverse split (without applying the split factor), and 2) another with the complete history. In some cases like FWLT, there could be two “delisted” symbols for the same company. two of the major German stock indices, DAX and MDAX. Are the Index DataSets Automatically Updated? Yes. When a DataSet is created from an Index classification groups and a symbol change is detected during an update, the DataSet is automatically updated when Wealth-Lab is restarted. Keep your eyes peeled for changes at the end of the Data Update Log and on Wealth-Lab Developer’s What’s New? Page!